Now let's make a corset - Part 2! Finally finished. It took longer than I expected as I tried not to rush with so many new techniques and rather thick layers of fabric. Any way here is the result. Pretty amazing, even though I say so myself. I am so glad I decided to go for a decorative fabric for the outer shell. There were some very pretty silk dupion fabrics in John Lewis but at £28 a metre I decided to try this burgundy crushed shimmer for my first project. Less than half price I would still get the full corset making experience. 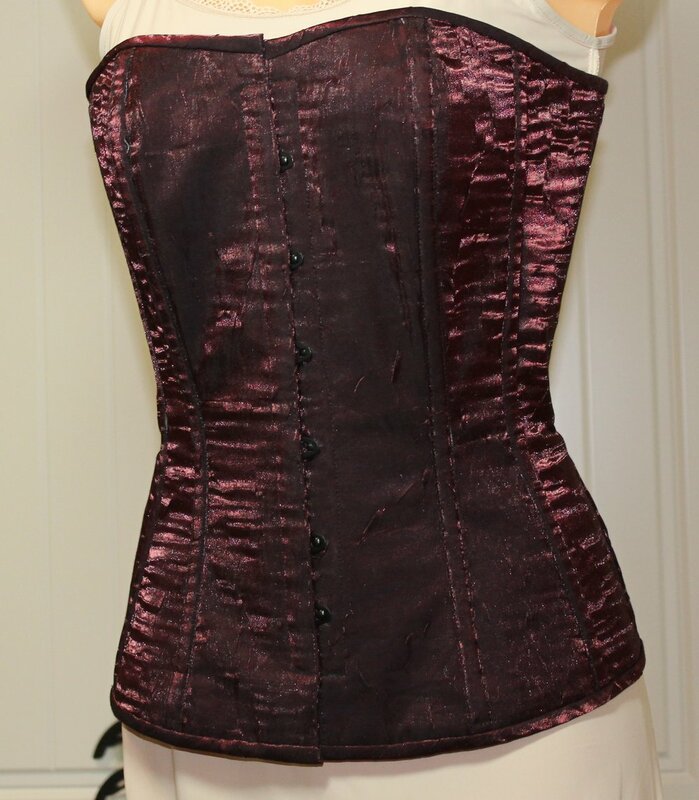 As this was the first corset I had made I attached boning to the seams only but the class takes you through the process of attaching additional casings for a more structured corset. The kit contains enough for the additional casings which is why it was so heavy. You need to line the decorative fabric with a woven fusible. I used the same weft-insertion as used in the class as I had some over from a previous project. You can get this from the English Couture Company. I apply the fusible to the meterage and then cut in one. The coutil and decorative fabric are cut separately. You soon get an idea of the thickness of the layers you will be sewing. The seams are sewn wrong sides together so that it is smooth next to the skin. The fabric does move around so you do need to make sure that all the layers line up. The next stage is to apply the front facings into which the busk is inserted, At this point I moved up from a size 14 to size 16 needle as there is a lot of fabric to topstitch close to the edge without a walking foot as this would have made seeing the edge more difficult. I did use an adjustable edge foot as a guide. The stud side is inserted first then the hook side. Yes, in the correct place. Then I needed a rest. The back facings are done next so that the eyelets can be inserted. The eyelets can be done with a hand tool but the pliers are so much easier. At this point I asked for some brute strength help to check firmly in place. After the very scary bit you get the very exciting bit. You need to try on to check the fit before applying the channels. Don't forget to pop the boning in either side of the eyelets while you do this. I had some minor tweaks to the bust area but starting to take shape. Once the fit is right you need to make the channels from strips of the lined fabric cut on the vertical grain. Glad I chose not to add any extra casings as the bias tape maker does get hot and then they have to be stitched to the seams right on the edge. The front shaped seam is the most problematic so I just took my time and then had a rest. Finally you cut the top and bottom bindings on the bias of the lined fabric. The top is done first, the bones inserted and the bottom to finish. I added a modesty panel to the back which is all carefully explained in the class. Obviously need the right colour laces but job done. Give myself a pat on the back - again.